Box Text: JOIN THE ROBO REVOLUTION! Design your own Custom Robo warrior, and battle your friends in a virtual arena! Create countless Robo variations, using nearly 200 specialized parts, including bodies, legs, guns, bombs, and homing pods. Set your strategy, customize your Robo, and enter the Holosseum! • … or go head-to-head in one of over a dozen Holosseums, and put your Robo to the ultimate test! 10-15-2015 elex Box Text Design your own Custom Robo warriors, and battle your friends in a virtual arena! Create countless robo variations using nearly 200 specialized parts, including: bodies, legs, guns, bombs, and homing pods. 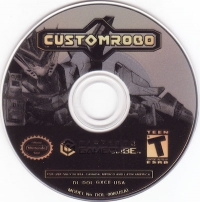 This is a list of VGCollect users who have Custom Robo in their Collection. 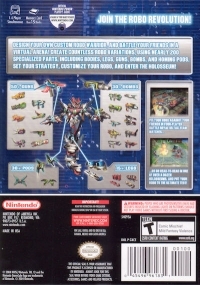 This is a list of VGCollect users who have Custom Robo in their Sell List. 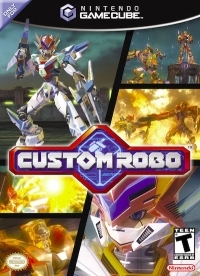 This is a list of VGCollect users who have Custom Robo in their Wish List.